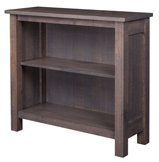 Case - 24" x 11"
The pictured Fireside Rustic 3 Shelf Bookcase is built in rustic pine with SA stain. Heritage Shorty 32" Bookcase. As always, Amish hand crafted with 100% fine hardwoods. Customize the wood type, finish type, and other features of your furniture using our drop down boxes (shown top right). This unique bookshelf has a shallow top that keeps your smallest books within reach, and a leg that curves in to support it. Most unique is the middle shelf, designed to tilt books at an angle to face the viewer. Finally, the bottom shelf is broad, for your heaviest books. Side slats complete the Shaker look of this heirloom bookshelf. Select your wood type and finish from our drop down boxes at top right..
For a large bookcase that won’t break the bank, the economy bookcase is perfect. Constructed out of solid wood, the five shelves won’t warp, bend or break from your personal library. Don’t forget to ask the Amish Furniture Factory if you can stain the bookcase to match your home décor. There are also 48” and 72” versions of this bookcase. Pictured in brown maple with Coffee stain. The twigs in this piece make it a unique bookcase, while solid wood construction makes it an heirloom. Pictured in pine with Burnt Orange - Distressed Antique. Pictured in rustic quarter sawn white oak with Stormy Gray stain. 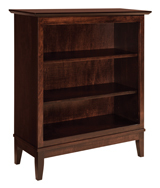 The Royal Mission 3240 Bookcase will add a Royally spectacular feel to your office, living room, library or study room. Walnut diamond inlays, solid corbels and slats is what makes the Royal Mission style stand apart from the rest. For a large bookcase that won’t break the bank, the economy bookcase is perfect. Constructed out of solid wood, the six shelves won’t warp, bend or break from your personal library. Don’t forget to ask the Amish Furniture Factory if you can stain the bookcase to match your home décor. There are also 48” and 60” versions of this bookcase. The pictured Fireside Rustic Bookcase with Doors is built in rustic pine with natural finish. Welcome to the Amish bookcases category! You have arrived at the right place if you’re looking for the best quality hand crafted solid wood bookcases available on the market today. We carry many styles and sizes of real wood bookcases available in different wood types, including oak, cherry, ¼ sawn white oak, maple, brown maple, rustic cherry and rustic hickory. Our smaller hardwood bookcases are readily available in oak and cherry, but can also be made with other domestic hardwood species if requested. Each wood type has its own group of four or more stain colors. If our many stain color options don’t suit your taste requirements or don’t match your current décor scheme or existing furniture, we have the ability to match our solid wood bookcases to your existing furniture or a sample. This is a great option for customers interested in increasing the size of an existing furniture set. Since bookcases are relatively simple in their design, it’s easy for our builders to make custom size adjustments according to your desired specifications. We can have our builders adjust all of the dimensions within a few inches per design, including the length, height, depth, and shelf quantities. Some of the styles of solid wood bookcases we offer are two piece full-shelf bookcases, two piece half-shelf bookcases with doors, single executive bookcases with adjustable shelves, single solid wood bookcases with or without doors, a variety of bookcases that hang from the wall, swivel bookcase, and glass door, drawer, and shelf bookcases. The styles our real wood bookcases are made in are: Mission Heritage, Shaker, and mix between the two styles. The benefits of owning an Amish made hardwood bookcase are their ability to handle the significant amount of weight associated with an accumulation of books. Since our Amish bookcases are made of the highest quality solid hard woods, they will be less prone to fall apart, crack, or have shelves bend after a few years of use. Amish hardwood bookcases are truly heirloom pieces built to last for generations.